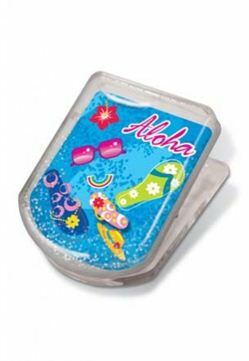 Keep your important notes or messages in plain sight with this innovative acrylic Beach Glam Floater Magnet clip. This magnet clip is filled with glitter and water and has a strong magnet backing. A perfect souvenir or gift from Hawaii to share with friend & family. Measures approximately 1-1/2" x 2". Great quality and nice size!